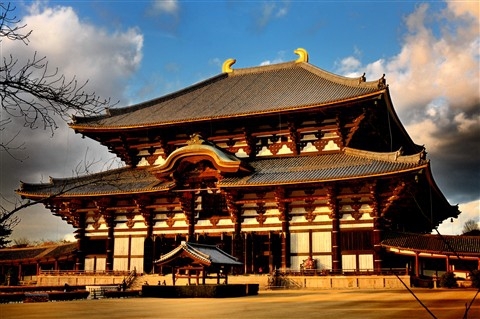 Todaydzi – (東大寺, Tōdaiji, “Great Eastern Temple”) – one of the most famous and historically significant temples of Japan, the main attraction of the city of Nara. The temple, built in 752, became the main Buddhist sanctuary in the region. The main hall Todaydzi called Daybutsuden ( “Big Buddha Hall”) is known primarily for the fact that it is the largest wooden building in the world, despite the fact that during the renovation of the hall in 1692 Daybutsuden area decreased by 1/3. 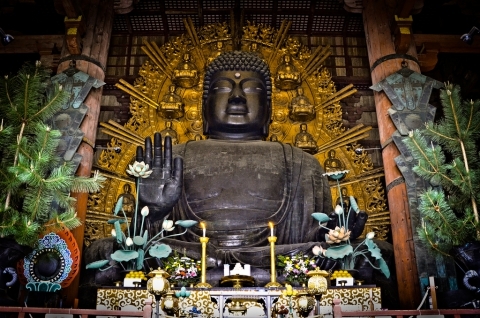 In the center of the room sits a statue of the Buddha Vairocana, “guarded” by two statues of Bodhisattvas, located on the left and right of the Buddha. 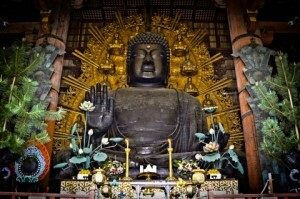 This is one of the largest bronze statues of the Enlightened One, called Daibutsu. According to legend, the statue has been manufacturing 2.6 million people, however, this figure can hardly be considered a real – at the time of Japan’s population was approximately 5 000 000 million. Nevertheless, it is known that in the manufacture of almost all gone Buddha bronze stock in the country. The hall presented Daybutsuden and other Buddhist statues and miniature models of the church in different periods. 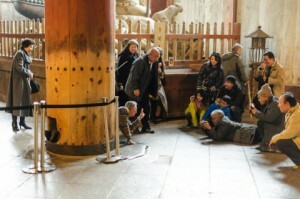 One of the popular tourist attractions of the hall is a column with a small hole, referred to as the “head of the Buddha.” According to an old legend, the one who will be able to get through the hole, descend enlightenment in the next life, and karma is cleared. 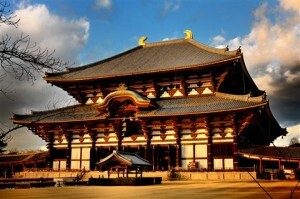 Temple Todaydzi occupies a large part of the territory of Nara Park. The temple complex also includes some free-standing building on a hill to the east of the main hall. On the way to Todaydzi are Nandaimon – huge wooden gate with two statues custody, recognized national treasure of Japan. 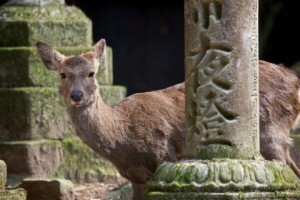 On the temple grounds also found deer, which came from Nara Park. The deer are allowed to feed the special cookies sika senbey, which you can buy from local merchants for 150 yen. In 2011, for the visits was opened Todaydzi Museum, located in the immediate vicinity of the gate Nandaimon. The museum presents an exhibition of the sacred relics of the temple, and Buddhist statues. Todaydzi is located in the northern part of Nara Park, a 30-minute walk from the station Todaiji Kintetsu Nara, or a 45-minute walk from JR Nara Station. Before the temple can also be reached by bus from any of the stations. Leaving the station Todaiji Daibutsuden. from 7:30 to 17 : 00 (October) Closed: no day off Price: 500 yen. 9:30 to closing of the church (entrance closes 30 minutes before the official closing) Closed: Between exhibitions Price: 500 yen (only museum), 800 yen (museum and temple).